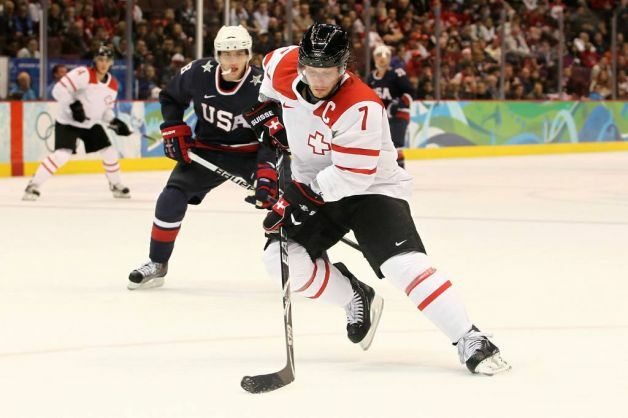 No NHLers For Simpson’s Switzerland? The national team of Switzerland very well might contain no National Hockey League players at the upcoming International Ice Hockey Federation World Championships this spring. The announcement that 20-year-old Olympic defenseman LUCA SBISA will not compete in Germany due to a groin injury means that three out of four Swiss players who skated in the NHL this 2009-10 season are now unavailable for selection by Switzerland’s new national team head coach, SEAN SIMPSON. Last week, the two NHL members of the Vancouver Olympic expedition, team captain of the New York Islanders and first-choice goaltender JONAS HILLER of the Anaheim Ducks took themselves out of contention for places on Switzerland’s World Championships team. 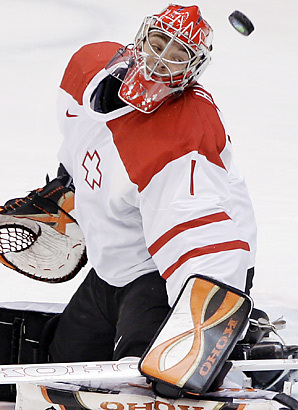 Hiller, who is ruled out as a result of an injured back, played every minute of all five games (2.47 avg, 91.82 svpct) for the Swiss at the 2010 Winter Games in Canada. The highly-experienced defenseman Streit, who paced the Swiss with 26:58 minutes of ice time per game and tied for the team lead with three assists at the Vancouver Olympics, begged off for reasons of fatigue; the 32-year-old rearguard has already appeared in his career at 14 major international tournaments (89 ga, 11 go 33 as, 44 pts) for Switzerland. The return to health of former NHL goaltender and 2006 Olympic hero MARTIN GERBER from a serious neck injury minimizes the loss of Hiller whereas the absence of Streit could be another story altogether. The fourth Swiss player to have played in the National Hockey League this season, 21-year-old Olympic defenseman YANNICK WEBER, is currently engaged with the Montreal Canadiens’ farm club, the Hamilton Bulldogs, in the American Hockey League playoffs.